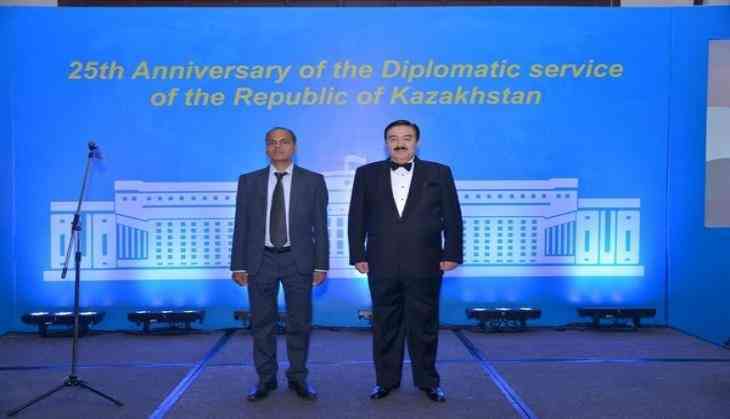 The Embassy of Kazakhstan organized a reception dedicated to the 25th anniversary of the establishment of Diplomatic Service of Kazakhstan at the Imperial Hotel here on Monday evening. The event was attended by the deputies of the Upper and Lower Chambers of the Indian Parliament, officers of the Ministry of External Affairs and other state bodies, heads of Indian companies, representative offices and international organizations accredited in the country, representatives of academia and the media. G.V. Srinivas, Joint Secretary (Eurasia) in the Ministry of External Affairs was the chief guest. Speaking on the occasion, Mr. Srinivas congratulated the diplomats of Kazakhstan on the professional holiday and noted the current high level of the bilateral relations as well as importance of the recent visit of Prime Minister Narendra Modi to Kazakhstan capital Astana to attend the Shanghai Cooperation Organisation (SCO) Summit. The Ambassador of Kazakhstan to India, Bulat Sarsenbayev, said in his welcome speech, that over the past two-and-a-half decades of independence, Kazakhstan has managed to achieve recognition in the international arena as a reliable and responsible partner for strengthening global and regional security. He also mentioned that due to the balanced strategic course adopted and adapted by Kazakhstan's President Nursultan Nazarbayev, today the country is a respected and recognizable member of the world community. He further informed that the country has taken an active part in the creation and development of such dialogue platforms as the Shanghai Cooperation Organisation, Collective Security Treaty Organization, Commonwealth of Independent States, Conference on Interaction and Confidence-Building Measures in Asia and the Eurasian Economic Union. The professionalism of the diplomats laid the foundation for achieving the current heights in the international arena. The last important, but not the least, victory of Kazakhstan was the admission to non-permanent members of the UN Security Council 2017-2018, he added. The Ambassador reminded that at present Kazakhstan has established diplomatic relations with about 180 countries of the world, more than 70 of which have opened their diplomatic missions in Kazakhstan. According to him, the Ministry of Foreign Affairs of Kazakhstan also took an active part in such international events as EXPO-2017, Astana Economic Forum, Eurasian Media Forum, Organisation of Islamic Cooperation Summit, etc. The Kazakh diplomat also recalled that this year Kazakhstan and India celebrate the 25th Anniversary of the establishment of diplomatic relations, which makes this year doubly significant. During the reception, on the occasion of the jubilee of the Diplomatic Service of Kazakhstan, the vocal group of opera singers "ART CLASSIC" from Almaty gave the performance and guests were able to have a taste Kazakh cuisine.